In today's Newsday Act II section (page E26), reporter Bill Bleyer profiles a well-known personality. For Howard Kroplick, it’s all about saving history — a passion to preserve that has taken many forms. 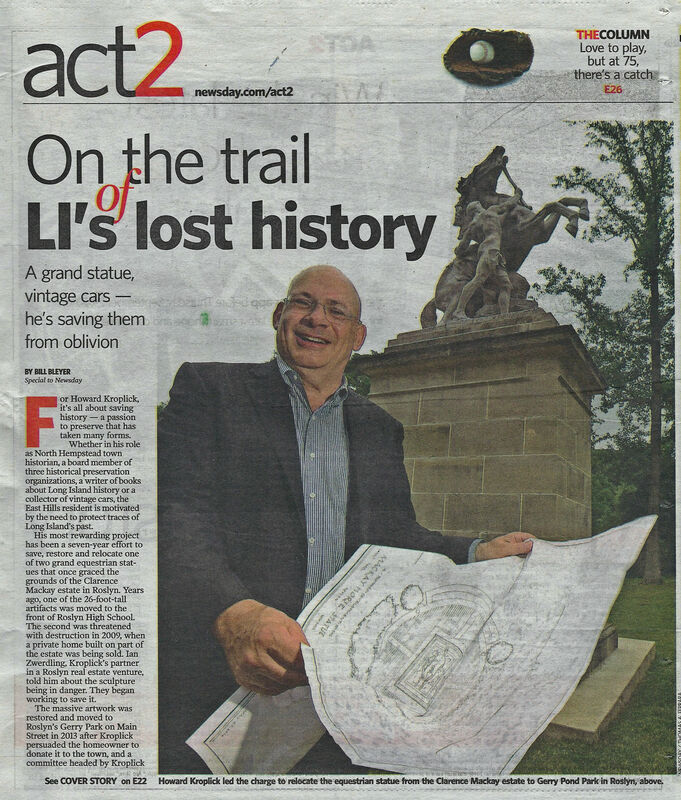 Whether in his role as North Hempstead town historian, a board member of three historical preservation organizations, writing books about Long Island history or collecting vintage cars, the East Hills resident is motivated by the need to protect traces of Long Island’s past. His most rewarding project has been a seven-year effort to save, restore and relocate one of two grand equestrian statues that once graced the grounds of the Clarence Mackay estate in Roslyn. Years ago, one of the 26-foot-high artifacts was moved to the front of Roslyn High School. The second was threatened with destruction in 2009 when a private home built on part of the estate was being sold. Ian Zwerdling, Kroplick’s partner in a Roslyn real estate venture, told him about the sculpture being in danger. They began working to save it. The massive artwork was restored and moved to Roslyn’s Gerry Pond Park on Main Street in 2013 after Kroplick persuaded the homeowner to donate it to the town, and a committee headed by Kroplick raised $150,000 to cover costs. During a recent visit to the town park, an ebullient Kroplick ignored a drizzling rain to show plans for the final phase of the project. Landscaping, improved lighting, historical interpretation signs and, possibly, paving stones will be installed this fall with a $71,000 Nassau County grant Kroplick obtained this year for the town. An architect is now working out the details. “It’s gratifying that we were able to save the statue and put it where the residents could really appreciate it,” Kroplick said. As town historian and board member of the Roslyn Landmark Society, Kroplick has been aiding the organization’s effort to restore Nassau County’s Roslyn Gristmill. That project has been talked about for years, but a $500,000 New York State grant awarded to the society last December will pay for stabilization of the structure and the initial phase of restoration. Kroplick is also drafting a proposal so North Hempstead can erect historical markers at all 18 town landmarks and historical districts. His fondness for the town and its history are reflected in his 2014 book, “North Hempstead,” (Arcadia Publishing, $21.99), with 207 black-and-white photographs. Robert MacKay, head of the State Historic Preservation Board, which recommends structures for landmark status, said of Kroplick: “He is passionate about local history. He is a great planner and catalyst.” MacKay, no relation to Clarence Mackay, is the former director of the Society for the Preservation of Long Island Antiquities, which appointed Kroplick to its board in 2014. Kroplick isn’t paid for his town historian and nonprofit positions. But he has been able to “follow my passions” because he sold his successful medical education firm in 2008. After working in the marketing department of Pfizer for nine years, in 1981 he started The Impact Group, which trained physicians and pharmacists about medical products. Pfizer was a client so he helped launch the little blue pill known as Viagra. With daughters Deborah Copeland, 35, and Dana Kyle, 32, both living in Manhattan, Kroplick can devote 25 to 35 hours a week to his volunteer positions. Over the years, Kroplick’s historical bent has expanded. He became an authority on the Long Island Motor Parkway and the Vanderbilt Cup auto races, held from 1904 to 1910, that were sponsored by millionaire William K. Vanderbilt II. He has worked to save the parkway’s remaining bridges and original roadway sections. In 2008, with help from daughter Dana, Kroplick created the website VanderbiltCupRaces.com. The same year he wrote his first book, “Vanderbilt Cup Races of Long Island” (Arcadia Publishing, $21.99) and later co-wrote, with Al Velocci, “The Long Island Motor Parkway,” (Arcadia Publishing, $21.99), a 128-page book with black-and-white images. He and seven other history buffs, enamored of Vanderbilt’s creation of America’s first limited-access highway — which stretched from Queens to Ronkonkoma — formed the Long Island Motor Parkway Preservation Society in 2011. Then he learned that the 1909 “Black Beast” was for sale. The American Locomotive Company racer won the Vanderbilt Cup in 1909 and 1910 and competed in the first Indianapolis 500 in 1911. Kroplick flew to Belgium to purchase it in 2008. “The tremendous history of that car really got me into loving vintage cars and their history,” he said. His auto collection also includes a one-of-a-kind 1937 Chrysler Imperial Town Car commissioned by company head Walter P. Chrysler for his wife. When it was auctioned by the Suffolk County Vanderbilt Museum in 2012, Kroplick snapped it up and had the deteriorated relic restored. He also owns the oldest Ford Mustang, a preproduction 1963 Mustang III Concept Show Car; and two Shelby Mustangs, years 2006 and 2007. With his automobile collection growing, he said, “I needed a place for my cars.” So in 2009 he bought a half interest in Zwerdling’s partially occupied warehouse on Lumber Road in Roslyn. Kroplick expanded the existing garage and the partners restored the 1980s building. Now called Waterfront at Roslyn, it’s home to an eclectic group of tenants including a watch repair craftsman, a ballroom dancing school and a rental space for events. It’s decorated with a historical automotive theme employing old signs and gasoline pumps. Visitors can view Kroplick’s classic cars through the garage windows. When not showing off his wheels, Kroplick keeps up with ongoing historical projects, such as the town’s effort to restore the 18th century Schumacher House in New Hyde Park. Excellent write-up Howard, and congratulations for the recognition of all your toils. It’s always nice to get good press! Great to see Newsday gave some well deserved recognition to Howard. Hoping to see Howard at Pebble Beach Concourse d’ Ellegance today. Just loved this story. Best to date! We read this with joy and pride in a man we consider epic to our passions and interests. You were and will always be a hero to my son Gram who literally glows in your accomplishments. This is great. Congrats Howard. Well deserved. You work very hard trying to preserve the wonderful LI history. People like you bring awareness to people like me and my son. And without people like Howard history just fades and disappears which is unacceptable. Thank you for all of your work. Growing up on a farm located off Vanderbilt Parkway in Hauppauge I’ve long appreciated the rich feeling for the land and it’s cultural history. Thank you, from an appreciative native Long Islander, car enthusiast and history buff . Great article in Newsday !! Nice story in today’s Newsday. Congratulations and thanks Howard for all you do! Great Newsday article about you, still does not do you justice to a very giving person. My son still talks about the your taking him for a ride in the1909 when you hosted the Jaguar club two years ago. Ed. Congratulations on your well-deserved profile in Sunday’s Newsday. You certainly have many irons in the fire and I’m inspired as I continue working on my first Arcadia book. What a great story in today’s Newsday. Nice piece by Bill Bleyer today, congrats! It’s really interesting to see all of your interests and achievements written about in one place. This article is well deserved recognition for the excellent work you do Howard. Your contributions to Long Island history are greatly appreciated by those of us that have known what you do. I’m happy to see that you are getting more credit for the important role you play in preserving our local history. Congratulations Mr. Kroplick, it is refreshing to see that there still exists someone of your caliber! Great story. Howard, you deserve all the recognition for your fine historical work! Nice job Howard. I think deep inside everyone is at least a little compelled to preserve some sort of history because deep inside we all know once it’s gone, it’s gone FOREVER, leaving just photography and videography if lucky. Not an easy feat for the average Joe and Joanne but more than happy to see your efforts actually come to life. Much more of same is needed. High five to you and your accomplishments. Congratulatons. 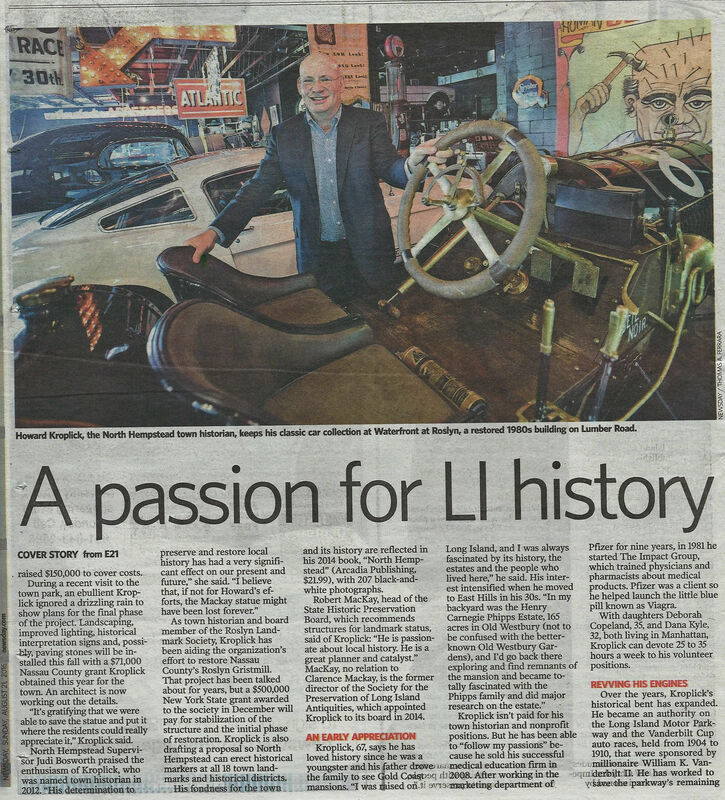 What a great article in Newsday on the 21st. You sure are keeping busy and you sure are making an impact! I think your smile shows how much you’re enjoying yourself.